Andrew Breitbart's staff has decided to rip a headline right out of The Orlando Sentinel to discuss about the overreaches of the government. 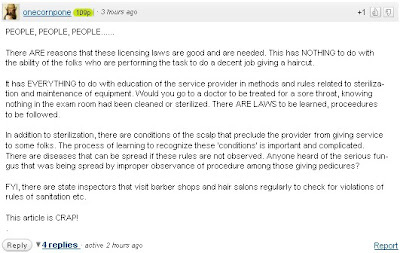 Bob Ewing discussed how Orange County deputies raided several barbershop establishments without warrants, under the authority of the Department of Business and Professional Regulation, who can enter the salons at will. Bob Ewing cited part of The Orlando Sentinel article and claimed that the arrests were part of a "barrier to entrepreneurship." "If the government is serious about creating jobs in this jobless recovery," wrote Ewing, "perhaps it should put away the handcuffs and start allowing entrepreneurs to put themselves and others to work." Ewing's article had all the makings of a right-wing propaganda publication - powerful government actions, oppressed civilians, assault on free enterprise. What Ewing leaves out of his post is context. Let me put things into perspective - the raids Ewing references took place in the Pine Hills area - a location known for high crime rates, which is the reason why local residents have dubbed the neighborhood "Crime Hills." It is for this reason local authorities had taken a proactive approach in combating illegal activities in the region - Ewing fails to mention just what police uncovered during the raids. The lone exception: Just Blaze on Semoran Boulevard in Apopka, where an arrest report shows deputies found Ski Joseph Vasquez, 40, with "2 baggies of cocaine in a prescription bottle" and cutting agents in the barbershop's office during the Sept. 17 sweep. Vasquez was arrested on drug- and gun-related charges after deputies said they found a handgun in his car. 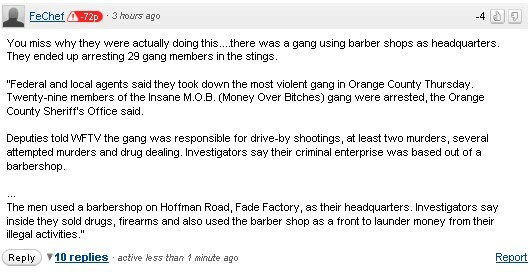 On the same day, deputies raided two other barbershops and found no illegal activity other than unlicensed barbering. And besides the arrest at Just Blaze, reports show the two sweeps turned up the following: evidence of gambling, equipment "that appeared to be used" to make pirated DVDs and CDs, "some sort of tax service," two handguns and misdemeanor amounts of marijuana. 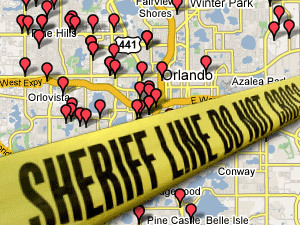 It could be that these sweeps are the reason why crime in Pine Hills is down 19 percent, as reported by WFTV. Pine Hills used to be one of Orange County's most violent and dangerous neighborhoods, but now crime is down as much as 19 percent. Residents WFTV spoke with said they've seen the difference. On the road in Orange County's Pine Hills neighborhood, Sergeant Jim DeLeu said the area once had a reputation for violent crime and it’s now settling down. "In areas of high-level of crime, there's a little bit of fear," he said. In fact, numbers show crime there is down 19 percent so far this year compared to the same time last year, and violent crime down 31 percent. Problem Area Policing Squad, or the”POPS” unit, has been on the streets for the past year. The unit has a new command post and an extra 20 deputies making their presence known in the community, talking to people and finding problems. "Operating in a manner that's not as threatening to people in the community,” DeLeu said. At Barber King's, Kenny Whaley has noticed things are changing. 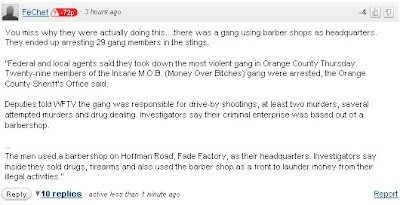 Justifying the operations, Orange sheriff's officials said the shops targeted had displayed a lack of cooperation with state inspectors and had a history of criminal activity. 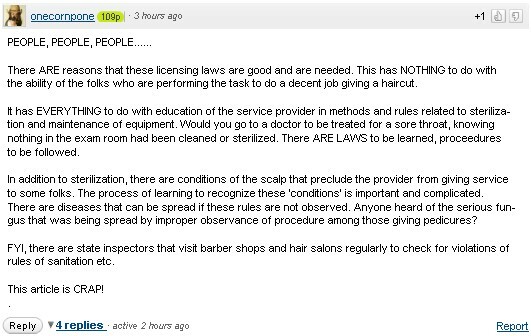 In terms of inspection history, the barbershops appear to have little in common. Records show some shops had lengthy histories of noncompliance, while others never had a complaint. In terms of demographics, the shops had clear similarities: Their clientele, owners and staff were predominantly black or Hispanic, and all were located in or near high-crime areas. The Big fanatics attacked the raids as an abuse of power - they failed to understand the scope of the raids and retreated back into their anti-government security blankets. I bet if the article was about police making unscheduled stops at Mexican restaurants to check immigration status the folks at Big Government would be grateful. I do have to give a shout-out to one commenter (with a positive IntenseDebate score) who defended the raids and the licensing, as well as calling the Ewing article "crap."